It's been uttered by every opponent of health care reform: Obamacare will kill small businesses. But the new law's rules don't apply to the vast majority of small businesses. The employer mandate, which forces firms to start providing insurance in 2014, pertains only to companies with at least 50 full-time workers. That's a tiny fraction of small businesses. As of 2010, there were roughly 5.7 million small employers, defined as those with fewer than 500 workers. Some 97% of them have fewer than 50 employees. That means Obamacare's employer mandate applies only to 3% of America's small businesses. The critics aren't convinced: "Small businesses don't have staff with the time and expertise to deal with the new system. It's a huge drain on these smaller firms," wrote U.S. Rep. Sam Graves (R-Mo. ), House Small Business Committee chair, in a recent editorial for The Washington Times. Why so much focus on so few firms? A Graves spokesman said the affected businesses include fast-growing "gazelle" firms, the startups that contribute a disproportionate amount of the nation's new jobs. "The more money these companies have to spend complying with health care mandates, the less they have to hire and expand," the spokesman said. Those costs aren't anything to laugh at. If they don't provide insurance, businesses with 50-plus workers face $40,000 in penalties and $2,000 for each additional full-time employee. However, nearly all of those businesses already do provide insurance: 96% of those with 50-plus workers currently offer health plans anyway, according to government data. That most businesses affected by the mandate already provide insurance doesn't necessarily mean their insurance is good enough or sufficiently cheap under new Obamacare rules. That's the counterpoint made by U.S. Senator John Barrasso, a Republican from Wyoming. "The mandates are for a lot more coverage than the average person would want, need or can afford. The business is going to have to spend time, money and have to figure that out," Barrasso said. For example, firms might be providing insurance that Obamacare deems unaffordable -- that is, if it costs more than 9.5% of a worker's income. But there are signs that most plans out there qualify under Obamcare's other requirement. More than 99% of those in work-sponsored plans have insurance that meets most Obamacare coverage standards, according to last year's study by NORC at the University of Chicago. Putting it all together, the data shows that only a tiny sliver of the nation's small businesses face the new rules -- and even fewer face any changes. 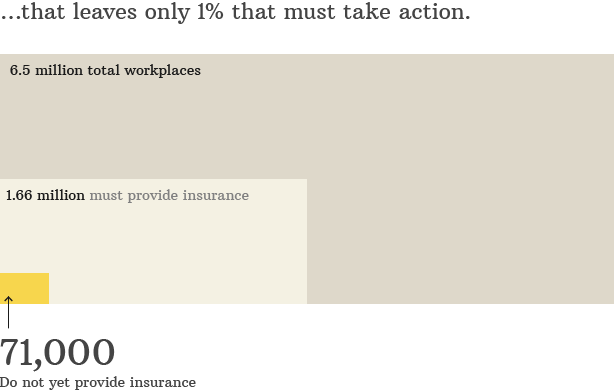 Of the country's 6.5 million workplaces, only 1% must actually start providing insurance next year. It's a reality that's likely to catch most small business owners by surprise, said Eileen Elliot, a Vermont health care attorney who advises entrepreneurs. "There's a lot of trepidation and misinformation out there," Elliot said. "I think it's time to do some education."